Should Tomorrow Be is a documentary film that recounts the story of a retired Indian-American cardiologist who suffers a simple fall at home that leaves him paralyzed from the neck down and dependent on a ventilator to breathe. As he processes this devastating reality, he struggles with the choice to live as a vent-dependent quadriplegic or exercise his right-to-die by withholding life-sustaining treatment. Through actual home hospital footage, Should Tomorrow Be shows the raw reactions of his family and friends as they rally around him as he deliberates and makes this life-changing and pivotal decision. 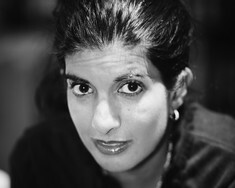 Malini was born in Cleveland, Ohio, to parents of Indian descent. She holds a degree in communications, a J.D., and a Masters in Law and Diplomacy with a focus on international environment and resource policy. Social and environmental justice issues are particularly important to her. She worked for several years with the United Nations and is founder of a line of eco-friendly, educational toys for children. Still, she has always had a deeper creative side — writing poetry, letters, taking photographs. She never professionally cultivated these talents but has always enjoyed the art of “capturing and conveying moments” in visual and written expression and moving people’s hearts and minds through these mediums. In 2006, when her father broke his neck and suffered a spinal cord injury and paralysis, her life was turned upside down. When he decided to disconnect his ventilator and life support, she was further stunned. Not knowing how to handle the reality of what was happening, she remembers just wanting to hold onto her father amid the emotional confusion. So almost as an unconscious reaction, she reached for her video camera and started filming. After reflecting for nearly six years on the events that took place in 2006, she gained enough distance, objectivity and courage to examine the tapes. While going through the hours of footage, she was surprised to find a beautiful trove of moments and miracles and realized that she had to tell the story — both for herself and for others. She also knew that the only way people could really understand what had happened was for them to see it. She thus embarked on the journey of making Should Tomorrow Be, which has proven to be a powerful and cathartic process of turning pain into art. Should Tomorrow Be was completed in July 2014. Malini is currently working on further projects that deal with social and environmental justice issues and is examining the possibility of a feature film.